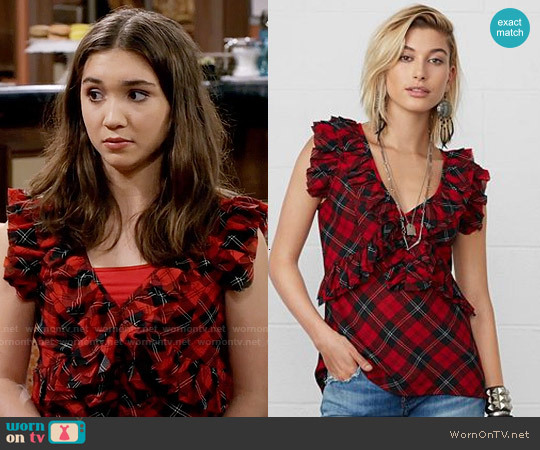 I’ve been catching up on shows, and Girl Meets World has a handful of episodes, where there was a ton of fashion. Here’s some fashion from various of the latest episodes. If I didn’t leave a link to the clothing, it’s because they’re sold out. 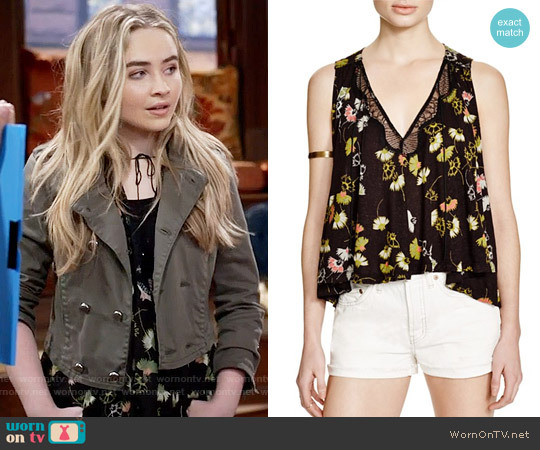 Riley wore this fun fringed top, and it worked with her preppy style because the colors are so playful and quirky. I love this skirt. It has such a beautiful print and I love that she wore it with this sporty type zipped top. I’m really loving these zippered shirts for the fall too. 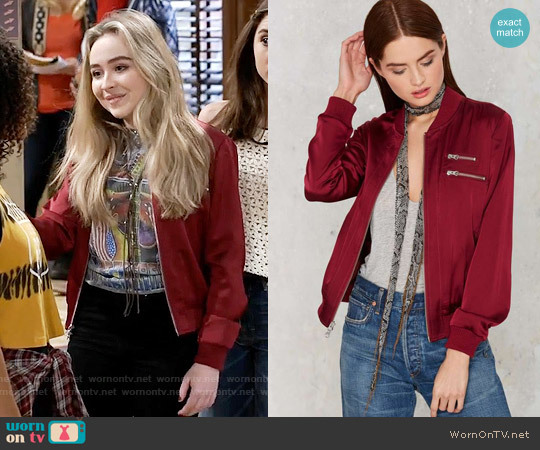 Maya’s bomber jacket is awesome for the fall. The color is gorgeous and I love that it’s in this satin material. Of course, she makes it more Maya by pairing it with necklaces and a graphic tee. Riley’s overalls are classic. The kind of staple everyone should have. I love the small rips here and there along with its relaxed fit. Maya’s jacket is really cute here, but I really loved the blouse here. The little peek of lace is super pretty with this delicate print. I like that she toughened up the outfit with this utilitarian jacket. Finally, I loved this top from Hollister. It’s super casual and comfy looking, which would be great for the fall weather too. Overall, I thought a lot of the pieces I highlighted are great for the changing weather. Thank you to WornOnTV for the photos provided. 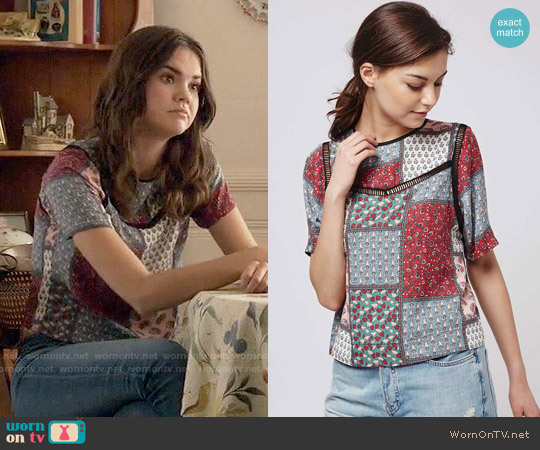 Additionally, check out the website for more fashion from television. I loved Riley’s little ruffled top with her bell bottom pants. It’s super preppy and romantic with the ruffles. She always rocks her bell bottoms, but I really liked the ruffled top paired with it. 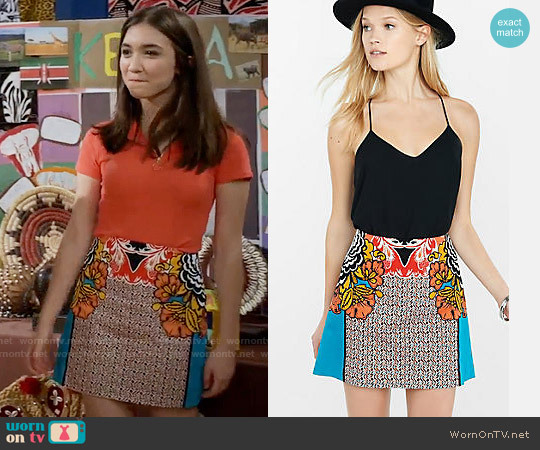 Maya also wears a staple in her criss cross top, but she pairs it with this boho skirt. I couldn’t find the details for any of the dresses, but I liked that Riley wore this dusty rose colored dress that was form fitting. Her romantic updo really looked pretty too. I also liked that Maya wore a fit and flare dress with simple hair and styling. I also liked Katy’s dress and how quirky and romantic it felt. 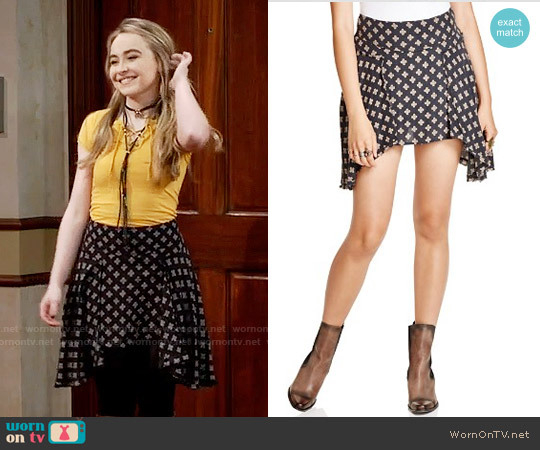 Thank you to Worn on TV, and Disney Channel for their photos and details on the clothing in the episode. I really wanted to like the PLL Finale, but I didn’t. When Cece was revealed as Charles, I was hoping for some sort of shock. Instead, Cece and Sara being behind everything just didn’t sit well with me. Here are my thoughts on the episodes. The Girl’s Goodbye– The show’s sentiment really is the friendship between the girls. It’s amazing how far they came as a team together. It was a sweet moment. The Punch– Go Emily! Sara had it coming. The Storytelling– Everything did fall into place, and I’m glad so many answers were given. Cece is Charles– So the episode was pretty disappointing and I feel like the writers chose the wrong direction with A. In the past when Mona, Ezra, and Toby were A, I had somewhat of an emotional attachment to each of them. I don’t have that with Cece. Also, I wanted to be shocked, and to some extent, we knew Cece was not all good. Sara is BOTH Red Coat and Black Widow– We just met Sara ten episodes ago, and I wanted characters from season 1 to surprise us. To me, it makes sense, but it seems like lazy writing to pin such crucial villains on Sara. Wren wasn’t A?– It just sort of made sense. I saw theories on Youtube, and it made so much sense. And I still would’ve been surprised to see how the story went. And Melissa would’ve been a great Red Coat. This week was another great episode of Nashville. I wanted to pinpoint a few of my favorite outfits from the episode. I’m really glad Juliette is back with her usual “power” outfits. I’ve missed her structured looks in season 3. Check out the photos below for more details. EQUIPMENT Slim Signature printed washed-silk shirt- $250: I really love how understated Rayna’s clothing is. She’s constantly wearing button downs and jeans. It definitely reflects her down to earth attitude towards everything. It’s a nice change compared to the other girls’ edgy clothing. Pierre Balmain Leopard Print Long Sleeve Sheer Blouse- $219: Juliette is back! She’s been wearing sweaters and t-shirts for a while. She’s clearly going crazy for the past few episodes, but it is nice to see her wearing her usual “power” outfits. I love the high collar and the animal print of this top too. Alice + Olivia Jacket – Drapey Gathered Crop- $485.00: Layla’s wardrobe usually involves black, so this jacket was a nice change. With her funky ponytail and black dress, she wears the jacket in an edgy way. Check out WornOnTV for more Nashville fashion! Hope you liked this post! There is a new episode of Nashville tonight! I apologize for not posting anything about the show for a while. I just caught up with the past few episodes. I love that Juliette is wearing some cuter clothes especially the gorgeous red dress she wore recently. I also thought Scarlett was darling in a long sleeve with overalls. DOLCE & GABBANA Ruffled cotton-blend lace mini dress $3,675– I love the color of this dress. It really pops, and I love how conservative it is. It kind of reminds me of her wedding dress by how simple it is. I don’t usually love the frills on the bottom of dresses, but I’m crazy about how chic it looks on Juliette. 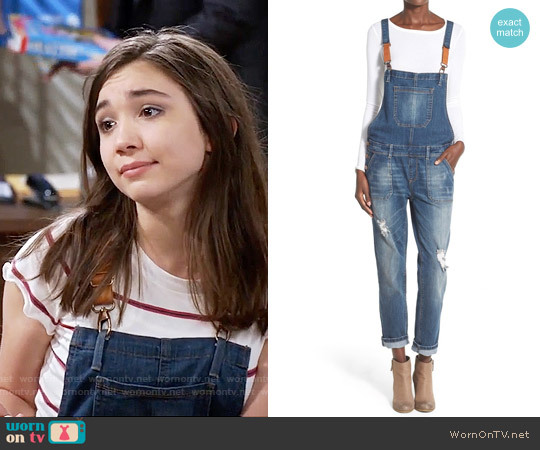 Free People Overalls $98– I felt so bad for Scarlett in this episode. She doesn’t deserve cyber bullying. I did like her cute little ensemble though. Overalls are very in style especially the shorter ones for the summer. She wears it well with a long sleeve with a peek of crocheted patterns. Thanks to WornOnTV for always updating their fashions on the latest episodes and for always providing the pictures.